Economy – Earlier in the year we were treated to predictions of anything between 1.8 – 2.1% economic growth in South Africa. Good news, by latter-day standards. The effect of this was an uptick in business confidence and the like. Our 1st quarter GDP drop is the largest quarter-on-quarter decline since beginning 2009. If you believe that prescient fund managers will protect your investments, you might add our Reserve Bank to that list of seers who don’t. 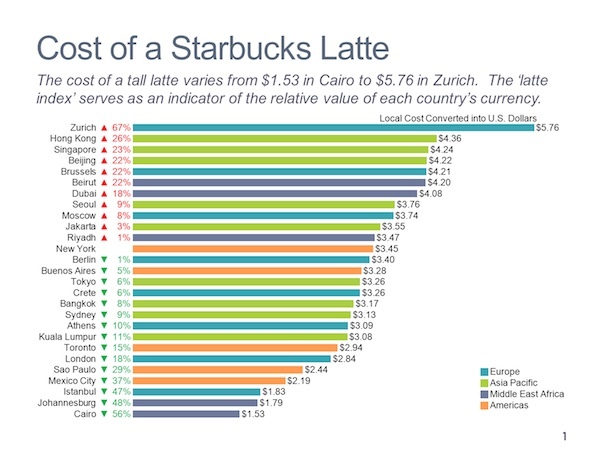 The Big Mac index should move over: take a look at the Latte Comparison below; we are probably not that badly off. An interesting snippet that I picked up, held that middle-class portfolios are dominated by housing holdings whilst the rich hold predominantly equities. The effect of this is that housing booms lead to substantial wealth gains for leveraged middle-class households. Stock-market booms boost primarily the wealthy. Services on tribal land: as I understand these things, one is allowed to build on your allocated plot on tribal land without submitting building plans and without necessarily having to connect to a formal road, water, sewerage or electrical grid. In municipal areas the intent behind such requirements would be public health, safety and ensuring access to services and the like. In remote tribal areas one can understand that these may not apply. However, there are those who abuse this system: outside of Pietermaritzburg a great many palatial houses may be seen which are built on tribal land and which have random and dangerous connections to district roads, accumulate sewerage on the property in septic tanks and so on. Farmers fall within municipal areas and may not build without plans. Tribal land owners not. Why? Conveyancing fraud takes many forms. The latest exploits the failure of the Registrar of Deeds to check the signatures of preparing conveyancers against his list of authorised conveyancers. If this interests you, I have written a short note on this and will forward this to you on request, together with the relevant High Court case emanating from Johannesburg. Despite our dire economic situation, SA Home Loans has said that the value of new mortgages has risen by 8% in the 1st quarter compared to that period in 2017 – the best improvement seen in 8 years. You know what a multiversity is? I did not. It is a large university with many different departments: which is what Stadio wishes to build at Phesantekraal, near Durbanville in the Western Cape. It plans such an institution for 100,000 students! Ambitious. Judgements in magistrate’s courts are not binding as are High Court judgements. Nevertheless, it was reported that the Randburg Magistrate’s Court accepted that digital letters of demand (SMSs) complied with the Electronic Communications and Transactions Act and are valid. High time. Today one finds two classes of trust accounts run by attorneys: those in which the deposits are guaranteed by the Law Society but where the Law Society takes the interest as quid pro quo, and those where the client receives the interest, but the Law Society does not guarantee the deposit. I hear tell that the latter deposits will, under the new dispensation commencing on 1 November, carry a 5% levy in favour of the new attorneys’ governing body. Is anyone able to verify this? An interesting case was published recently in which the Eastern Cape High Court found that a surety has the right to be informed of facts beyond his information that may affect the decision given by him, when providing the security required by a bank. Worth a read for practitioners. The value of usufruct calculations is based on a 12% return on the value of the property concerned (which is probably 50% higher than the real return today). The tables dealing with these have, to my knowledge, been in use since 1956. The effect thereof is that the value of usufructs is skewed in favour of usufructuaries. I find it amazing that no one has yet sought to take on SARS on these. I would be most interested on your thoughts, if you agree? Proxismart will not lie down: an appeal against the recent High Court judgement has been noted by Proxismart. For those not in the know: this company wishes to do conveyancing, currently reserved work for conveyancers only, and was given short shrift by our High Court. Ask me for a copy of the appeal. This Tuesday the first of the cases against a Durban practice, which employed the then well-respected attorney, Colin Cowan, will commence in the Pietermaritzburg High Court. That firm has joined its auditors, a local financial adviser and an audit company which allegedly managed elements of the scheme. The total sum involved is reportedly well over R100m. It is going to be quite interesting to see what comes of this, as these claims have been brewing for several years. What they are doing is plain: They appropriate legitimate black struggles (from land hunger to transformation to restitution to justice) and use them for their own selfish and criminal ends. Justice Malala on the new “Zuma political movement”.